with dental implants. Due to the nature of teeth to shift and move, dental implants can keep your teeth straight and improve overall dental hygiene. The procedure is quite simple actually. First the bone is analysed to make sure it is sturdy enough to support an implant. Second, depending on the bone’s strength either a bone graft is made or an implant is inserted. To insert the dental implant, your oral surgeon will drill a pilot hole (think of drilling a hole in a piece of wood to then insert a screw) and insert the implant abutment or base. The next step is to allow the site to heal and have the crown made. On your next visit the doctor will fit the crown to the base of the implant and you’ll have a new tooth! 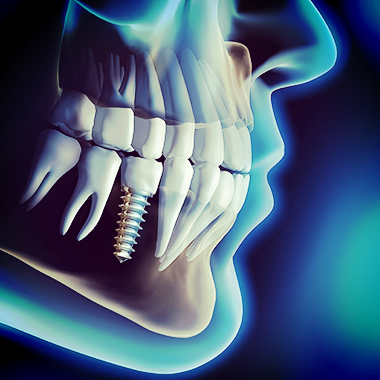 The cost of dental implants fluctuate little based on a few factors. If you need an extraction, the density of the bone and grafting, the position of the implant in the mouth and type of crown needed. Costs of dental implants are usually anywhere from $1000-$3000 or more depending on each individual case. Hoyt Dental offers monthly payments as an option for these type of procedures. The obvious benefit is the ability to have a new tooth where one was missing. No one wants to have a whole in there smile and a dental implant is the most permanent way of replacing a tooth. A dental implant has and advantage over a bridge because you don’t need to ruin the teeth on either side of the missing tooth to fit them with crowns. Another advantage is not having to clean under the pontic (middle of the bridge) where food can possibly get lodged. Since flossing between the teeth of a bridge is not possible, you will use floss threaders to pull floss underneath your bridge. A dental implant functions just like a normal tooth and you won’t notice that any of your teeth are different. An added benefit to dental implants is their ability to maintain their position and not allowing the teeth around them to shift. Generally when there is a hole in your smile, your teeth will begin to move together to fill the gap. In some cases, braces can be used to shift the teeth in your smile to fill a gap. In most cases however, you won’t want to shift your smile just to fill a gap.